Even though hair loss is not a life-threatening condition, it is still a major concern for many people. Scientists all over the world are doing their best to find a cure for this condition while people spend huge sums of money on true and false methods of hair restoration. 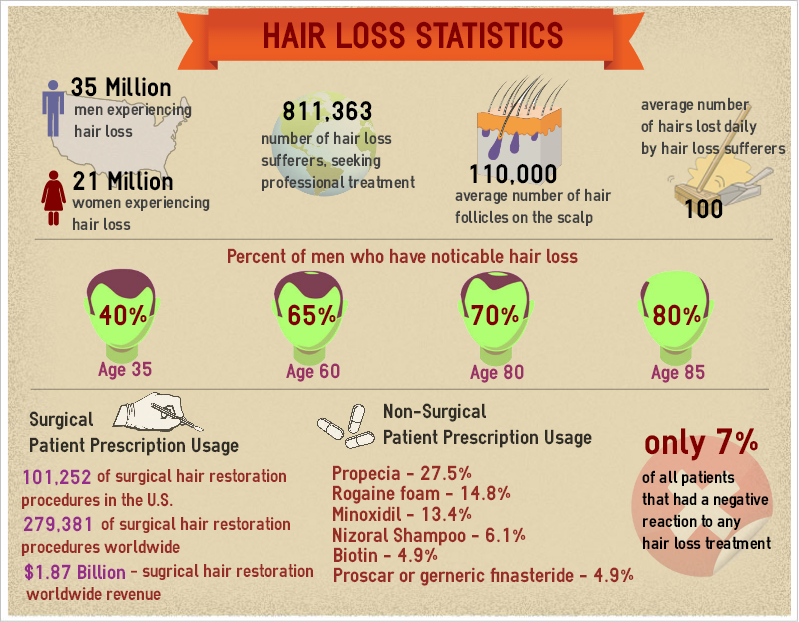 There are many reasons why a person might start losing hair. However, the most common reason is androgenic alopecia, more commonly known as Male/Female Pattern Baldness. Regretfully, this is the one cause for hair loss that remains untreatableby medications. Anyone who claims to be able to restore your hair using some “unique potion” is lying to you – the process of hair loss can only be slowed down. Usually, when we are talking about hair loss, the first picture that comes to mind is an image of a middle-aged man. However, in reality, hair loss can affect both men and women of any age. Moreover, some forms of hair loss are more common in women than in men. Statistics show that 65% of men and 80% of women have some form of hair loss by the time they reach their sixtieth birthday. The reason why men are associated with hair loss is that women lose their hair diffusely and rarely develop a completely bald patch. What should I do if I start losing hair? First of all and most importantly, you should seek advice from a trichologist (a doctor who specializes in hair). Since hair loss can be caused by a large number of factors, this condition can be merely a symptom of a more serious disease. This is why it is always a good idea to consult a doctor if you notice that you are losing hair. A Trichologist will be able to choose the right treatment for you and, in some cases, completely restore your hair. On the other hand, if you decide to deal with this problem yourself, there is always a chance that you might choose the wrong treatment and lose your hair. The worst case scenario is that you overlook a serious disease. Keep in mind that, gradual loss of hair is a natural process as you age. This type of hair loss is called involutional alopecia. There are a number of causes for alopecia that do not lead to permanent hair loss and which can be treated. These include certain illnesses, recovery from major surgery, chemotherapy and hormonal imbalance. In order to ensure that you have as much information as possible on the treatment you are about to commence, we have compiled comprehensive data on a large number of hair loss treatments ranging from herbal remedies to the most recent Follicular Unit Transplantation. Moreover, since this website was created for informational purposes only, you can be sure that we are unbiased when presenting this information to you.